One of my favorite moments in Prague had very little to do with Prague. I stopped into the Absintherie and ordered an Absinth Old-Fashioned at the recommendation of the bartender. I sat at a small table beneath pictures of absinthe-riddled masters of writing: Poe, Hemingway, and Wilde. Inspired, and sure that important words were about to flow from me as well, I picked up my phone and texted my husband. We had one of the best conversations we’ve had in a while (unless I was hallucinating?) and it made me miss him. Absinth made my heart grow fonder. Next time, I’ll explore Prague with him. 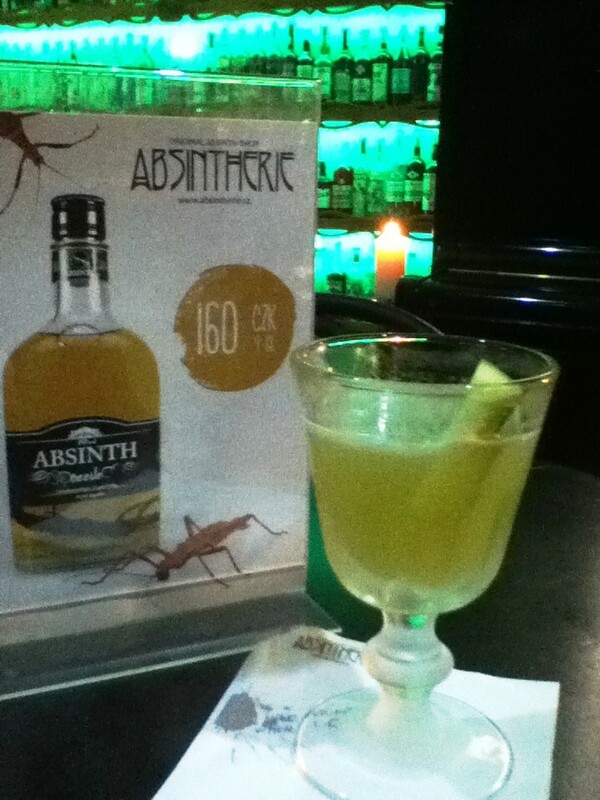 Has the Green Fairy (absinthe) ever held its spell over you? Love the heading! Very clever. What a great place. What is the link (if any) between the drink and the city? It’s the sort of discovery that must make travelling worthwhile. Apparently, the Czech way to prepare the drink is different than in other places. In the Czech Republic, they use a sugar fork to hold the sugar cube over the absinthe cocktail and then set it on fire. It caramelizes the sugar. Plus, the Czech, or Bohemian-style absinth is anise-free. It’s produced differently there. I’ll tell you one thing, they’ve capitalized on the market for it there. It’s found in nearly every souvenir shop, but I went straight to the bigger (better?) source. The walking stick is inside some bottle (kinda like the worm in tequila), but it wasn’t in the drink I had. Very cute title and so sweet that you had that loving conversation with your hubby in such a neat place. 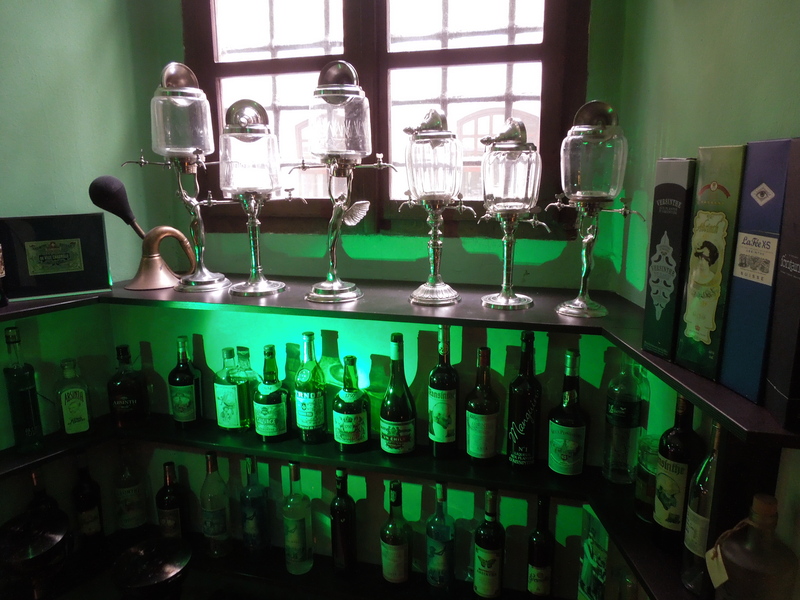 I never had a proper absinthe when I was there, since I was in my early 20’s and had no taste. 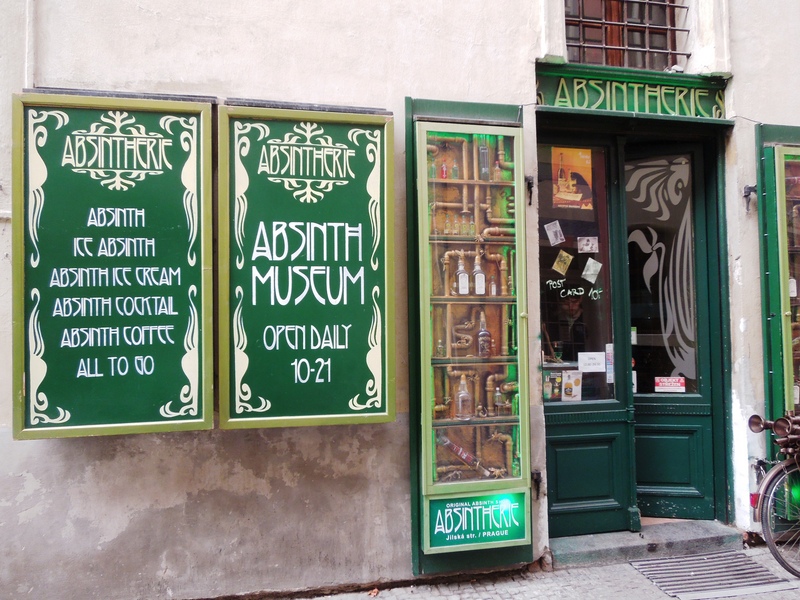 I tried some absinthe straight up and it was horrific…not the way to drink it properly. The sweet young woman behind the bar must have guessed I wouldn’t like mine straight. She said she doesn’t either. So she suggested I have an old-fashioned. It was delicious! It can rip your face off if you drink it straight! Oh my! Glad I didn’t. Especially since I had to find my way back through the winding streets of Prague afterward and I got lost even when I wasn’t drinking! I’m under the impression that it’s hard to find here in the States, too. As others have mentioned, I love the title of this post too. And loved reading about how the Czechs prepare the drink too. A sweet story. Thanks! I’m not sure whether I’d try lighting it on fire myself. Especially after having imbibed. But since that’s not the way they prepare absinth in other countries, I think it’s okay to skip that part of the process. I agree, trying that after having drunk a bit might be a bit dangerous, haha! 😀 We only had the imitation ones. I was working in Italy and we’re not allowed to drink the real thing. I’m not sure if we’re allowed to drink the real stuff here in the States, either. The alcohol content is pretty high, so I’d guess not. I would love to try that stuff!